Florida has the best solar resource east of the Mississippi but yet the Sunshine State lags far behind other “less sunny” states. It’s not the lack of sunshine. One of the biggest barriers to meaningful solar development are burdensome taxes which drive up the cost of solar power here. Taxes are a big reason that Florida – a state with no solar incentives – has 9 million energy customers and yet less than 12,000 rooftop solar systems. By comparison, New Jersey has over 43,000 rooftop systems with half the population and most certainly less sun. Florida voters will have an opportunity to change that by voting YES on Amendment 4 during the August primary election. The proposed amendment, if passed, will exempt solar systems from taxes for 20 years. A YES vote on Amendment 4 lowers solar energy costs by lowering taxes on solar installations – because the taxes are passed on to customers in the form of increased solar power prices. That’s a big deal in Florida where a couple cents can make or break the economics of going solar. Better solar economics means more solar development, which lays the groundwork for cleaner air and a more sustainable future for the next generation. More solar development means more solar jobs. The solar industry is creating jobs 12 times faster than the overall economy, yet very few of those jobs are based in Florida. One in 83 new jobs created in the U.S. last year was in the solar industry; a victory on Amendment 4 would mean that more of those jobs would be going to Floridians, providing well paying opportunities and economic growth for our state. The title and summary of the amendment below can sound complicated, but the concept is simple: lower taxes = lower solar energy costs. 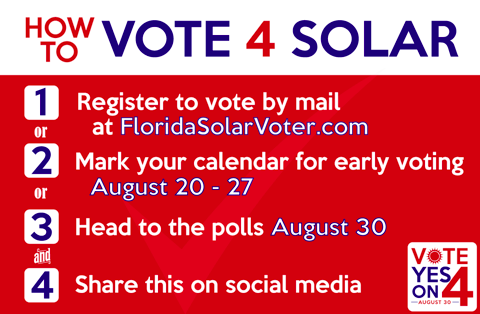 Of course there are other policies that are important for strong solar power development in Florida but the Amendment 4 tax exemption for solar power is the most immediate action voters can take to jump-start solar development in the Sunshine State. Voting is easy in Florida. Votes can be cast 3 ways. Sign up to Vote by Mail at floridasolarvoter.com. Or you can vote early or in person on August 30th. However you choose to vote, be sure to Vote Yes on Amendment 4. Our future will be better for it.